Stone & Wood Cleaner is a water-based cleaning detergent for cleaning stone, masonry and wood. 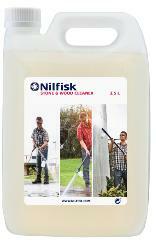 Stone & Wood Cleaner is also an excellent detergent for cleaning facades of any objects that endure water. Coverage: Approx 125 m2 per 2½ litres. Cleaning by hand: 300 ml to 10 litres water. Stone & Wood Cleaner is a gentle - but very efficient detergent to remove dirt.